Experts from the European Union Mobile Laboratory (EMLab) ready to support Ebola samples testings in Guéckédou, Guinea. Together with Ministries of Health and other partners across seven countries in West Africa, the United Nations Children’s Fund (UNICEF) is using culturally-sensitive communication strategies to disseminate life-saving information in order to contain the often-fatal Ebola virus, through text-messaging, radio shows, TV programmes and door-to-door campaigns. 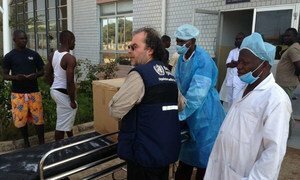 “Most of the people in this part of the world had never heard of Ebola before,” said Dr. Guido Borghese, UNICEF’s Principal Advisor Child Survival and Development for West and Central Africa. In collaboration with partners such as the Red Cross and the UN World Health Organization (WHO), UNICEF mass and digital media, as well as inter-personal communication activities, are being carried out to prevent people from contracting the virus, particularly in mosques, churches, schools, health centres and markets. These “information blasts” are being implemented in Guinea, Liberia, Sierra Leone, Cote d'Ivoire, Senegal, Mali and Guinea-Bissau, where UNICEF is also providing critical prevention supplies, such as soap, chlorine, and gloves to the people in affected communities. The region is facing its first major Ebola outbreak. The disease, which has no vaccine and no cure, has already claimed 111 lives in Guinea and neighbouring Liberia as of 8 April. In total, a growing number of 178 suspected, probable and confirmed cases has been reported in Guinea and Liberia, as well as six suspected cases in Mali. In order to provide disinfectant products, essential medicines, life-saving supplies, and communication support, UNICEF is urgently appealing for $1.2 million for Guinea and almost $1.3 million for neighbouring countries including Liberia, Sierra Leone, Senegal, Guinea Bissau and Mali. The number of suspected and confirmed cases of Ebola (EVD) in Guinea has jumped from 103 to 122 in just three days, with 80 confirmed deaths, said the United Nations World Health Organization (WHO), which will now focus on preventing further transmissions of the often fatal disease.